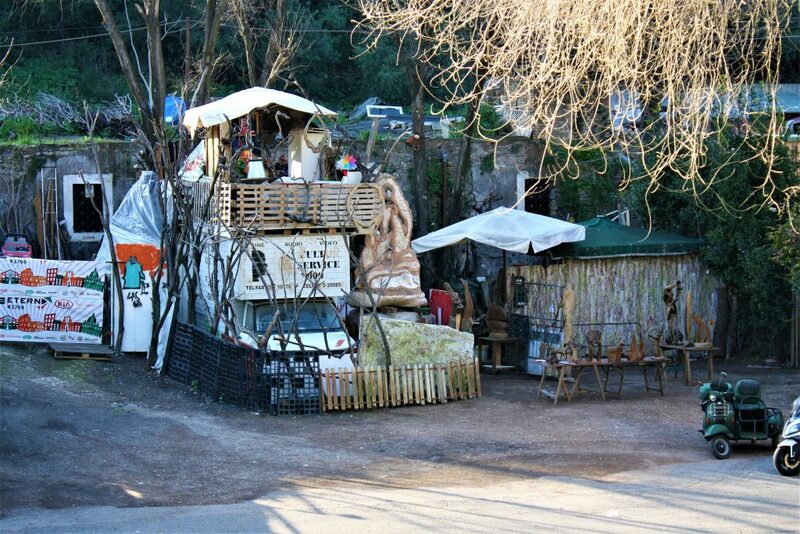 There is no other place in Rome that sums up the untouristy soul of the city better than Testaccio. If you find yourself baffled at the foot of an ancient pyramid neighbouring some fascist architecture, don’t even think you’ve seen the district’s quirkiest part. Eyes open wide, take an intense dip into its bohemian heart – especially the artistic den dug under a heap of amphorae, a multipurpose area inside the old slaughterhouse complex, and a certain graveyard that’s non-Catholic for a good reason. Don’t worry if these and other marvels tax your stomach — the district happens to boast Rome’s biggest organic market, bustling with hip local eateries which, by night, give way to the city’s alternative nightlife scene. The district owes its eclectic trait to the ancient river port of Emporium built in the 2nd century BC to cope with Rome’s ever expanding trade. In those days buffaloes climbed the paved road up the banks of the river Tiber, grunting under the load of marble, grain and wine until a brawny Roman relieved them from their burden, stored inside the amphorae. These sizeable jugs, once worn out, would be broken into pieces and clumped year by year, to finally take the shape of the hill of shards — aka Monte Testaccio, or Monte dei Cocci, the most famous landmark in the district and now home to several bars and cafes (see the By Day section below). The surviving quay of the port, with steps and ramps towards the river, and even the mooring holes, makes for a good urban spotter’s quest along Lungotevere Testaccio. Following the decline of the Roman Empire and their clattered amphorae, just like its hill of shards in the past, the area continued to accumulate social waste – dropouts relegated by refined society from within the city walls – namely the poor, the batty, and the rebellious. Later, 19th-century industrialisation transformed Testaccio into a traditional working-class neighbourhood, bringing new opportunities to its needy souls. At the same time, the railway, the slaughterhouse and markets, as well as the gas plant, breathed more shady life into the quarter. And since infamy and low rents have always lured the creative, a recent touch of gentrification has seen Testaccio develop its current artsy-hipster vibe — a brushed up version of its character over the centuries. 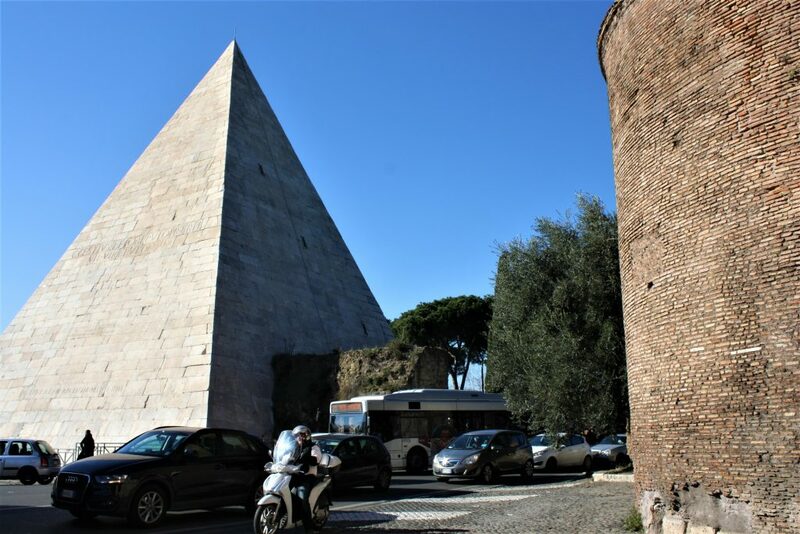 Whether you see it straddle the Via Marmorata, contrast with the Aurelian Wall or pop up behind an 18th-century cemetery, the 37 metre Pyramid of Cestius is sure to baffle the first time visitor. Especially since this Egyptian cone doesn’t even accommodate any Egyptian official. The tomb was prehumously commissioned by Caius Cestius, a Roman politician, and simply reflected the aesthetic tastes of the time. For the more inquisitive, 1.50€ guided tours are the only way to explore the excavations around Piramide and they can be booked by calling 06.39967700 (Coopculture, from Monday to Friday). Whether you see it straddle the Via Marmorata, contrast with the Aurelian Wall or pop up behind an 18th-century cemetery, the 37 metre Pyramid of Cestiusis sure to baffle the first time visitor. The best lookout up to the pyramid is from the oldest wing of the eccentric Cimitero Acattolico sitting partly within the ancient city walls — all together, a perfect fit for such an offbeat district, especially if you add up a nearby colossus of the Testaccio Post Office. Its architectural style — evocatively named Rationalism — captures the spirit of bygone Italian fascism: the imperial grandeur of lofty size but with an imposing, functionally-raw finish. It might come as a surprise to an unseasoned Roman wanderer, but this rough, block-like formality of MIAR (Italian Movement of Rational Architecture) is celebrated as fiercely as many of the city’s ancient monuments and proudly represents “The New Rome.” For more on Italian fascism try this tour. Five minutes down Via Caio Cestio sits the above-mentioned graveyard, dubbed “The old cemetery for non-Catholic foreigners”. 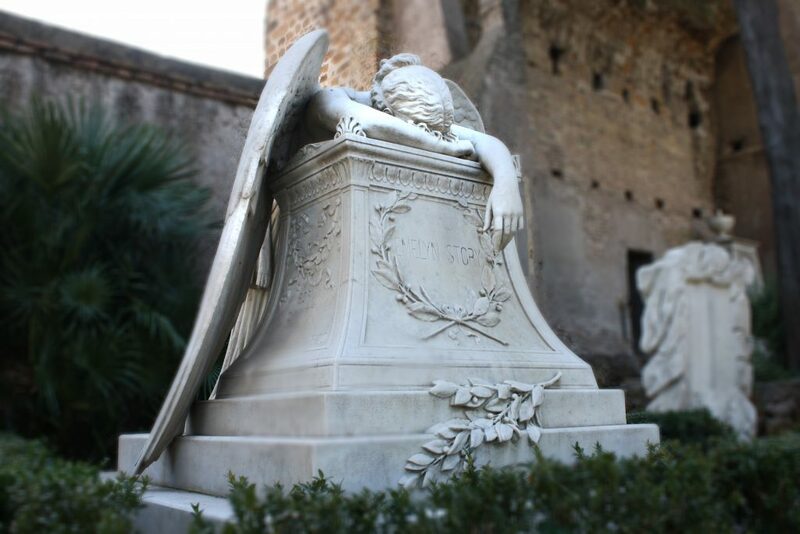 Dating back to the 1700s, it’s a poignant collection of memories and artisan twists, with the world-famous Angel of Grief sculpture by W.W. Story its hallmark feature. The garden-like alleys almost give an impression of a posthumous resort for celebrities rather than a burial ground — and indeed Keats, Shelley and Goethe’s only son, along with numerous political gurus and princesses are permanent residents. There’s no ticket office, but visitors are kindly asked for a 3€ contribution. Meanwhile Get Your Guide offer a full guided tour. …this ancient disposal of broken storage vessels is an unparalleled source of what we know about Testaccio’s daily life in antiquity. What’s more, it’s likely the only rubbish dump on earth that rents space to cafes and bars. Opposite the Cimitero Acattolico’s entrance sits an aesthetically unappealing, greenish mound — the famed Monte dei Cocci, or Monte Testaccio hill. At first, you might feel disappointed and underestimate it — Insta-wise — but mind that this ancient disposal of broken storage vessels is an unparalleled source of what we know about Testaccio’s daily life in antiquity. What’s more, it’s likely the only rubbish dump on earth that rents space to cafes and bars. One of them is an award-winning osteria Flavio al Velavevodetto serving the district’s culinary highlights, such as the coda alla vaccinara (oxtail stew), or tonnarelli cacio e pepe (noodles with pecorino cheese and black pepper) as a meat-free alternative. However, the easiest way to sneak into the heart of the landfill — a cave believed to be a primeval wine cellar — is through Antonio Petronzi’s squatted atelier, accessible luckily for just a smile (and heartily for a cigarette!). 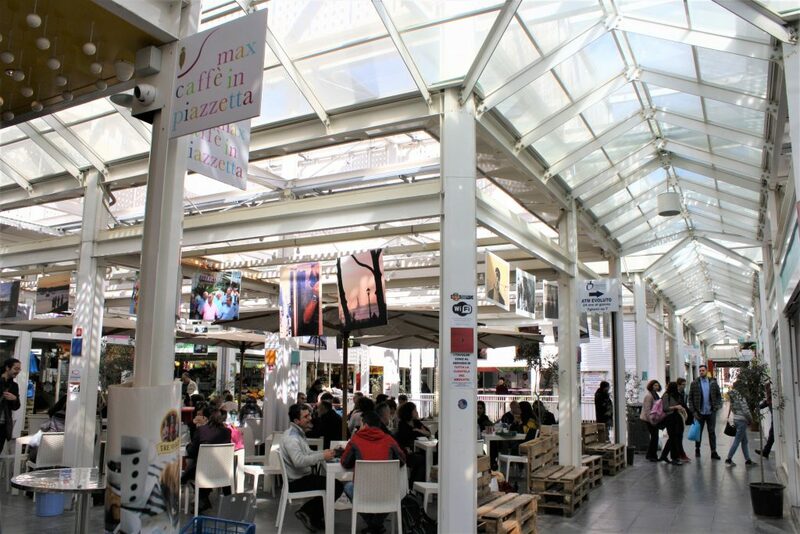 If you’ve already digested your first Testaccio food sampling around the dump and have space for some more, or simply everything was closed before Italian lunchtime (something between 12:30 and 4:00 pm), the New Testaccio Market is waiting with open doors. More than just a roofed grocery with artisan stalls, this eco-friendly and sustainable space is also the locus of Roman social, cultural and culinary encounters, spread over five thousand square meters and apt for all palates and pockets. Squander on a pair of funky wedges and sip the guilt down with a chalice of finest rosso or bianco for 2.50€ at Chicchi & lettere — you can come back after lunch for their praised dark chocolate & coffee mousse. Before that, however, you might want to first raise your gastro-efficiency with a fat-burning smoothie at Zoé’s, just a few boxes away. As for the ideological palates, the district’s historical role as a major abattoir left it with a heavily meaty legacy, but the award-winning Mordi & Vai runs vegetarian sandwiches with “Roman Style Artichoke,” that is, steamed with garlic, wine and parsley, and optionally topped with pecorino cheese. 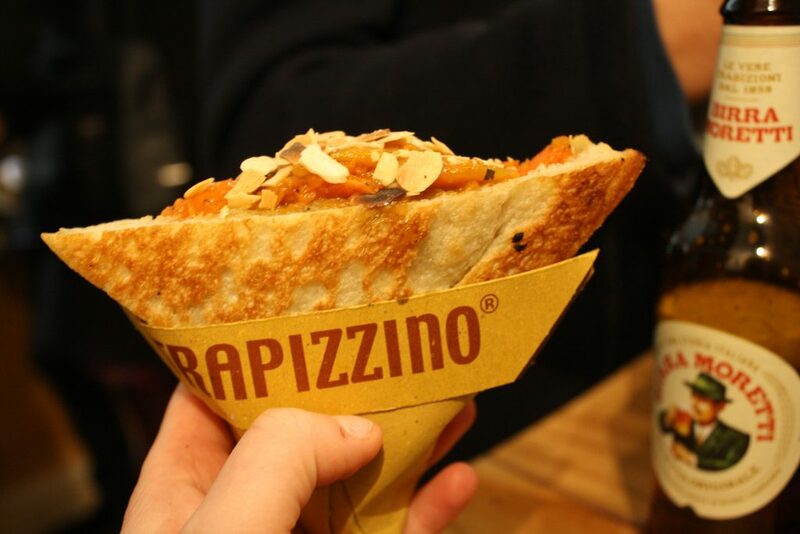 If you prefer to have a guide to deconstruct Testaccio’s foodie scene then you might want to consider signing up for this four hour food tour (or this more affordable 2.5 hr option). The neighbouring ex-abattoir, a suggestive representative of Italy’s “industrial archaeology” from the 1800s, has long converted into a leading stage for diversity in the contemporary art at both national and international levels. Its focus has been set at an ultra-modern angle offering an alternative, urban perspective on the Eternal City. Here, technology often upstages the classical means of expression and hence, renders the experience more relatable to our digitalised reality. The space of MACRO Testaccio — with suggestively preserved elements — opens up daily (save Mondays) to the afternoon ruckus of the neighbourhood and stays up until 10 pm. 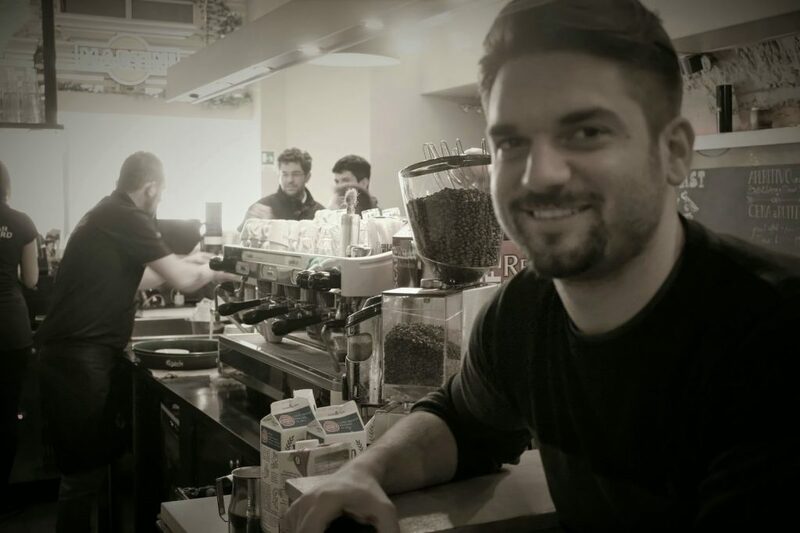 “I love the cosy atmosphere here; it’s like a little town on its own where everybody knows each other, and yet, you’re in the centre of Rome. The spirit of Monte dei Cocci and the university vibe also keep you here. Airbnb’s flags dapple the district densely enough to satisfy a decent range of budgets. Worth considering in a place like Testaccio where having a local included may be invaluable for a richer experience. If you aren’t into Airbnb’s personalised hassle, then the three-star Re Testa Hotel that shares its walls with the New Testaccio Market is a fair-luxury accommodation within walking distance of the historic centre of Rome, and yet reasonably priced (starting from around 70€ per single room). We love delving into the world’s greatest districts, so if you haven’t yet taken a tour of Harlem (New York), Kazimierz (Krakow), Kadikoy (Istanbul) and North Amsterdam with us, now is your chance! Plus be sure to call by our Secret Seven things to see and do in Rome, and our Long Weekend guide for more tips. Marta is an independent travel journalist, as well as blogger at Vegan Beauty Travels. You can run into her in both chic and shady venues, as long as there is a gripping story involved.